Atopic Dermatitis is a chronic eczematous skin disease, in which the skin becomes extremely itchy and inflamed, causing vesicle formation (minute blisters), cracking, redness, swelling, weeping, crusting, and scaling. Global Atopic Dermatitis Drugs market is anticipated to grow with a CAGR of 4.77% over the forecast period. The base year considered for the study is 2018 and the forecast period is 2019-2027. The important driver increasing growth in the global atopic dermatitis drugs market is the growing prevalence of food allergies that are exacerbating atopic dermatitis. According to a research, food allergy and severe atopic dermatitis coexist in approximately one-third of all children with atopic dermatitis. These food allergies are mainly caused by chicken eggs, cow’s milk, peanuts, wheat, nuts, soy, and fish. Also, atopic dermatitis once appeared in childhood can exacerbate with time. Poor patient adherence due to inadequate information on drug usage is the major factor hindering the atopic dermatitis drugs market. After some observance, it could be said that even in specialist centres, the patient outcomes are not positive owing to non-administered treatment. This is primarily due to the inadequate time spent on patients for educating them about atopic dermatitis and medications by the physicians. As a result, the extent of side effects and the threat of toxicity associated with atopic dermatitis drugs increases due to the unawareness of the proper drug usage. The Global Atopic dermatitis drugs market segments include Route of Administration (ROA) and Drug Class. 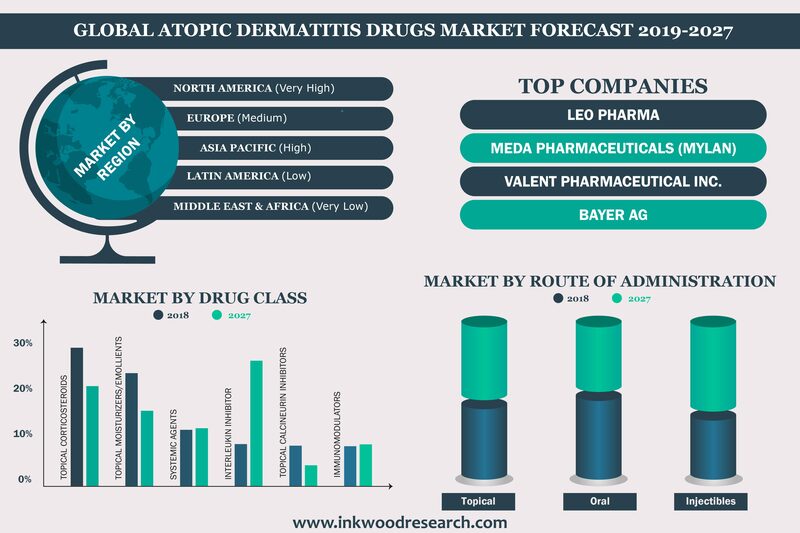 This report covers the present market conditions and the growth prospects of the global atopic dermatitis drugs market for 2019-2027 and considered the revenue generated through the sales of atopic dermatitis drugs for the route of administration as well as drug class to calculate the market size by considering 2018 as the base year. The Atopic Dermatitis Drugs market in North America is expected to hold the largest share by 2027. The growth in the North America region is mainly driven by growing incidence of allergic conditions among the population which has increased the growth in atopic dermatitis drugs market. The government in North American countries such as the USA are also contributing towards the growth of the North America atopic dermatitis drugs market. The government has stringent regulations and norms for these drugs but, at the same time, is putting efforts to decrease the duration of clinical trials for the same. The United States holds the largest revenue share in the global atopic dermatitis drugs market. The accessibility to therapies by reimbursement programs is further expected to result in a high turnout of patients opting for treatment, thus propelling the growth of the market in the US. The atopic dermatitis drugs market is segmented based on its Route of Administration; which are sub-divided into oral, topical and injectable. Route of Administration (ROA) determines the time taken for a drug to undergo its mechanism of action and show its efficacy. The antibiotics given for oral treatment are also used for intravenous treatments. These antibiotics are effective in managing atopic dermatitis, especially when the skin shows signs of bacterial infection such as weeping, pustules, crusting, or painful swelling (cellulitis). Topical ROA is the most effective treatment with the least side effects. These drugs are applied directly to the skin like ointments or creams. Injectable ROA is the least used out of the three and has a very less market share. LEO Pharma AS (LEO Pharma) (LEO), a company owned by LEO Foundation, is an independent, research-based pharmaceutical company. The company develops, manufactures and markets pharmaceutical drugs for dermatologic and thrombotic patients. The company operates in Europe, the Middle East, Africa, Asia Pacific, and the Americas. LEO Pharma is headquartered in Ballerup, Denmark. Another company, Valeant Pharmaceuticals International Inc. (Valeant or ‘the company’) is a multinational specialty pharmaceutical company engaged in the development, manufacture, and marketing of pharmaceutical products primarily in the areas of dermatology, neurology, gastrointestinal disorders, and eye health therapeutic classes. The company markets its products in the US, Canada, Europe, the Middle East, Latin America, Asia Pacific, and Africa. It is headquartered in Quebec, Canada.